Wikki Stix 3-D Life Cycle of a Poinsettia Craft for Kids! In most stores during the holidays, kids can see bright red, pink, white, or bi-color Poinsettia plants. They are beautiful plants that have a unique growing cycle. Creating the poinsettia life cycle with Wikki Stix not only encourages fine motor skills, but it creates an interesting 3-D science craft for learning through play! Poinsettias are tropical plants that are often on display and given as gifts during December! The SEEDS or SHOOTS of a Poinsettia are planted in the spring. During the spring and summer, the Poinsettia plant GROWS and DEVELOPS DARK GREEN LEAVES. By Fall, the Poinsettia will require 10-13 hours of TOTAL DARKNESS each night in order to produce the bracts (the red colored “cups” are often mistaken for the flowers of the Poinsettia plant). The Poinsettia needs to be in an environment where the temperature is between 60-70 degrees F. In the fall, when the temperatures drop, growers move the Poinsettias inside to greenhouses (houses that growers use to control temperature and environment of growing plants). In December, the Poinsettia plant will BLOOM and produce the beautiful colored bracts (cups) the children see on the plants during the holidays. The actual flowers of the Poinsettia plant are the yellow buttons found in the center of the red bracts. The yellow flowers will produce seed pods containing the seeds. Remind the children that as the Poinsettia seeds are dispersed by humans or animals, the Poinsettia plant life cycle repeats. Materials needed: 1 paper plate per child/craft, red/green/yellow Wikki Stix, one printable Life Cycle Labels file (linked above), and scissors. Invite the children to craft their life cycle by making an area or tray for the children with the supplies listed above. The children can use two strands of Wikki Stix to divide their paper plate into 4 sections. 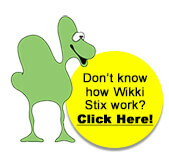 Ask the children to make a plus sign with the Wikki Stix on their plate (+). To make the seeds/shoots: the children can make balls or cut smaller pieces of yellow or green Wikki Stix with their scissors for the seeds or shoots of the Poinsettia plant (Wikki Stix can be cut with safety scissors, but younger children may require assistance). Have the children press the Wikki Stix created seeds or shoots into the upper left-hand corner of the paper plate (see photo at the top). To make the growing plant: The children can cut one strand of green Wikki Stix in half to form the leaves of the growing poinsettia plant. Each ½ strand is then folded in half to form a loop for creating a shape resembling a leaf. If desired, the children can pinch the top of the loop to create a tip for the poinsettia leaves. The children can then press the Wikki Stix created leaves onto the upper right-hand corner of the paper plate. *Note – invite the children to create MORE green leaves as they are practicing with the green Wikki Stix. They will need more green leaves to finish the paper plate craft. 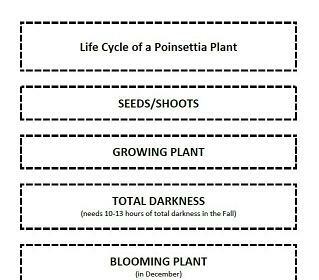 Total Darkness: Because the Poinsettia plant requires TOTAL DARKNESS for extended periods during the growing cycle, it is necessary to include that phase in the life cycle of the craft. 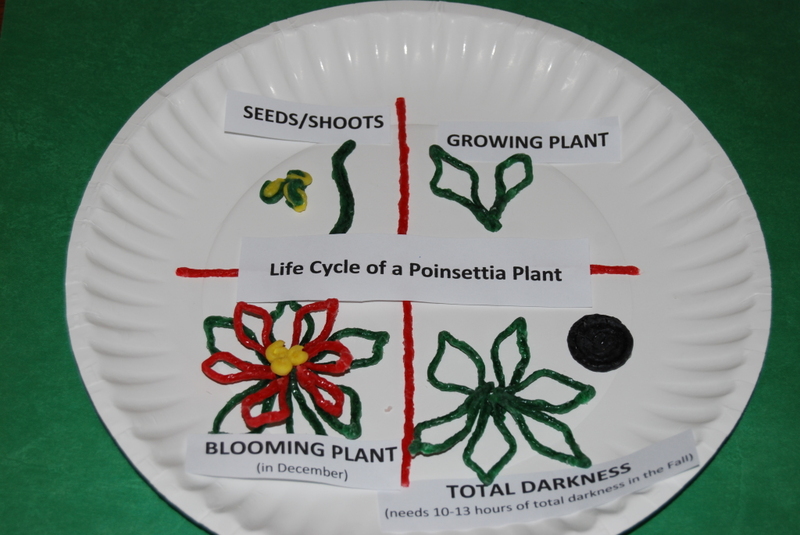 Invite the children to create the Poinsettia plant leaves and a dark moon (to indicate total darkness) and press those shapes into the lower right-hand corner of the paper plate. To make the blooming plant: Invite the children to use the green leaves (as constructed above) to make the bottom of the Poinsettia plant. Red leaves can also be crafted (in the same manner as the green leaves) and pressed on top of the green leaves for a 3-D effect. The yellow pieces in the middle of the craft are the flowers. Have the children cut small pieces of yellow Wikki Stix to mold the flowers for the center of the craft. All constructed parts of the mature plant can be pressed onto the lower left-hand corner of the paper plate. As you see Poinsettia plants out during the holidays, be sure to take a closer look with your children. Look for the leaves, the colored bracts, and the yellow flowers in the center of the plant. Creating the Wikki Stix paper plate craft is a fun activity to extend and integrate learning into holiday routines. **Note: the Poinsettia “poisonous myth” is simply not true. A child would have to ingest a lot to cause illness. Please supervise children closely when handling real poinsettia plants. While some children prone to allergies may get a rash from the pollen of the plant (especially those allergic to latex), most plants carry that same risk. If exploring a real plant, be aware of any allergies your children might have and wash hands thoroughly.